Fall is upon us and the leaves of change are inspiring us to transform ourselves and shift our styles. From sundresses and tanktops, we are moving into cozy sweaters and layered looks with hair colors changing from honey blondes to muted cool beiges. It’s time to be the trendsetter for fall and you have came to the right place for inspiration. Here is a sneak peak into the top celebrity hairstyles that are inspiring us this fall season! Ariana’s high pony with full hair and large curls keep the look youthful and bouncy. Cocktail your heat protector and a light mousse. Blow dry your hair in sections with a round brush (the longer your hair, the bigger your brush and vice versa). This step is really just to help you polish your hair and start the curl. Tilt your head back and secure a high ponytail with an elastic. This helps you achieve a higher ponytail. When you tilt you head back forward, the hair at your neckline will be smooth and tight! Take a small section of hair and wrap it around the base of the ponytail to hide the elastic. Use a large, 2-inch barrel curling iron and curl up to the ponytail starting from the ends. It would be a great idea to pin curl the curls and let them cool before taking them down. Try Wella Flowing Form for heat protection and Wella Natural Volume Mousse or Extra Volume Mousse for volume. I like these products because they leave the hair totally brushable and touchable! Any face shape and hair type will be able to wear this hairstyle. Adding bangs would personalize it even more! Try using your favorite necklace or bracelet to hide the ponytail elastic. Don’t be afraid to let some of the hair around your face down with this look either. This is probably the most popular look this season. Celebrities everywhere are wearing their hair down and smooth, some tucked behind their ears or just naturally flowing down. Prepare damp hair with a heat protecting lotion and part in the middle. Blow dry your hair with a paddle brush to straighten. Add gloss drops for added heat protection. Iron hair with the proper heat. Add more gloss to your hair and tuck behind your ear. I like Wella Enrich Straight Leave-in Crème for heat protection and Wella Oil Reflections for fine to medium hair or Wella Mirror Polish for medium to coarse hair. This look is pretty versatile, however if you have a square, heart or diamond face shape, you would want to avoid putting your hair behind your ears. If you have a long shaped face, you would probably want to incorporate a side bang or have the part for the look start on one of the sides. Don’t be scared to add in a clip-in extention for a little extra color. If it is a natural tone, even better! The most simple of all the looks, this natural texture with the added hair accessory make it easy to recreate and individualize. After showering, towel dry hair and spray in a sea salt spray. Diffuse hair until about 85-90% dry. Let hair dry naturally to finish before you run your fingers through to break apart the waves. Use Wella Ocean Spritz Beach Texture Spray for that gritty, just-left-the-beach look and Sebastian Shine Shaker for incredible shine. Take the ends of your hair and tuck them back into the headband to create a boho chic faux bob. Smooth and elegant, this wavy look is perfect for any occasion. Add your favorite leave-in heat protector to damp hair. Blow dry with a medium to large roundbrush until completely dry. 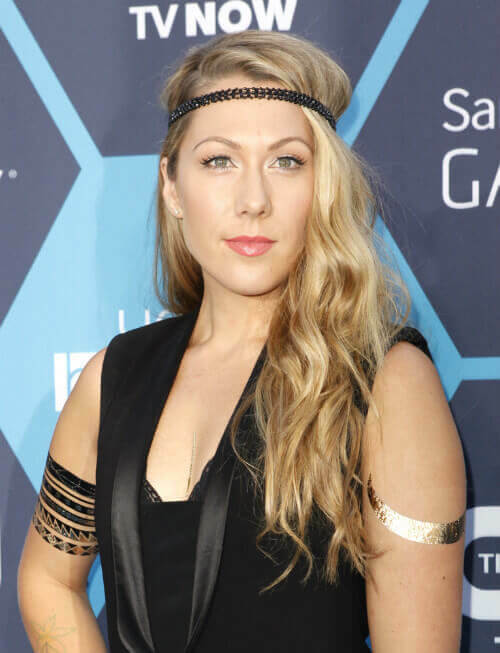 Wrap hair around a 1½-inch curling iron (going away from your face) and let the curls hang to cool. After the curls have cooled, use a boar bristle brush to brush all of your hair to one side. Add a small amount of shine serum to finish it off! I love Wella Flowing Form for gloss and heat protection and Wella Luxe Oil for a gloss that won’t weigh the hair down. If your hair isn’t long enough to reach around from the back of one side to the other, try adding a braid on the short side to hold it that way. Give short hair a test drive without the commitment using this tucked in updo a la the always lovely Felicity. Always add a heat protecting lotion to keep blonde hair like this protected. Use a natural hold mousse for volumized texture and root lift. Round brush the hair in small sections and, as you move on to the next section, pin the previous one up like a pin curl to help the hair curl cool off in its curly state. Once dry, take small sections beginning from the front and backcomb the roots for volume throughout. Gather your hair as if you are going to put it in a ponytail and roll it into itself at the back of your head and pin it. Don’t worry about hair that is left out — it will give a more natural look! Spray hair with a firm hairspray from 10-12 inches away. This will keep the hair looking dry and not moist from the spray. Aveda Smooth Infusion Style Prep is a great heat protector for this look and it has natural aloe for moisture. Wella Natural Volume Mousse is going to give you exactly what it promises — natural volume without the crisp feeling from other mousses. Wella Stay Firm or Aveda Control Force Hairspray would both work to secure any flyaways and keep this pretty style in place. Any face shape can wear this tucked updo depending on the parting, fringe and volume achieved. For super fine hair, add a foam block the same color as your hair to help make your hair appear fuller in this style. This “everyday” style works for almost everyone. It’s a great way to keep your hair out of your face without pulling it all the way back this fall season. Add a heat protector to damp hair and section hair down the center. Blow dry hair smooth with a paddle or round brush. Using a 1-inch curling iron or tong, wrap hair around the tool, going away from the face. Once you let the curl down, give it a little tug to lengthen the curl. After finishing all of the curls, add a small amount of shine serum and brush your hands through your hair gently to give gloss to the style. Use Wella Flowing Form for heat protection and Wella Oil Reflections for a lightweight shine. Heart, round, square and diamond face shapes wear these glam waves well. Avoid this style if you have a long face because the hair close around the face and could make it appear even longer. Don’t curl the hair over the top of your head. Keep the curling iron or flat iron on the sides of your head to have the curls start lower. This updo is perfect for when you want everyone to think you spent hours on your style this fall season. They best part? You can do it in mere minutes! While hair is damp, cocktail your mousse and heat protector and add them to your hair. Blow dry smooth using your favorite brush. Separate hair from ear to ear going across the back of your head and create a ponytail with the section underneath for later use. Add volume to the entire top by backcombing the roots and then brushing the hair back with your fingers. Add an elastic to that hair right above the other ponytail. Braid both ponytails and roughen them up a little bit by stretching them out a bit. Wind them around a little and pin them to back of the head. Finish with your favorite hairspray. I recommend Wella Extra Volume Mousse, Wella Flowing Form Heat Protector, and Wella Stay Firm Hairspray or Sebastian Shaper Plus. Oval, long (if you keep it more flat on the top of the head), round or square face shapes can all wear this style with an added side fringe. Add the pins into the hair in a swirling motion. It will capture more hair and hold it even better. Make sure the wavy side of the bobby pin goes closest to the head because as you push it in, it will grab up hair close to the head and stay super secure. 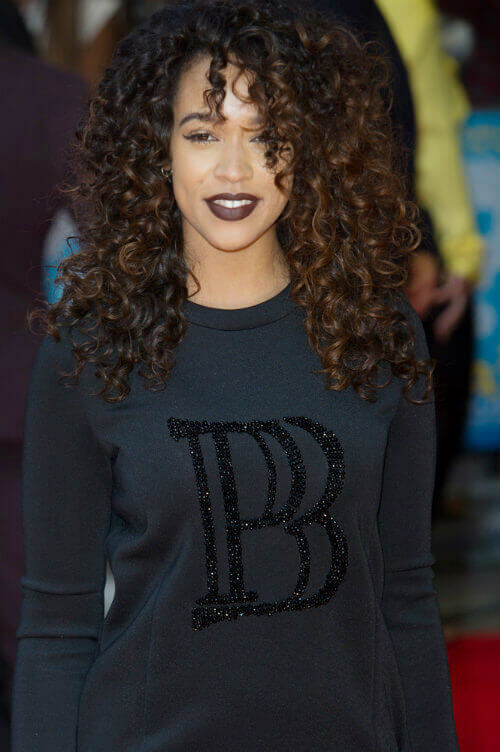 Tamera Foster’s Curls Gone Wild! If you have naturally curly hair, set it free for fall! Cocktail your favorite deep conditioner or leave-in conditioner with a shine serum and work through damp hair. Rake your hands through all of your hair from roots to ends to help encourage the hair to have lift and separation. Grab the ends of your hair and shake them a little to loosen the sections. Diffuse until about 75-80% dry and then let the hair dry naturally after that. I love Aveda Brilliant Universal Styling Crème for a leave-in shine lotion and Aveda Brilliant Emollient for a shine serum. This style works well with all face shapes, but keep some bobby pins with you in case you get overwhelmed by the curls falling into your face. Curly hair is super easy to create a quick updo with. Instead of keeping a hair elastic or tie with you, keep a bundle of bobby pins (I keep some in a Tic-Tac container!) to give yourself a quick up style that’s sexier than a typical pony. This look is a great go-to hairstyle when you don’t want to stress about pinning your hair up this fall. Cocktail a heat protector and mousse or gel together and add to the hair before blow drying smooth. Wrap vertical sections around a 1-inch curling iron and pull the section gently to loosen the curl before moving on to the next section. Once you have all the curls complete, rake your hands through your hair to loosen things up a bit. Add a light hold hairspray to keep the shape soft and touchable. I recommend Wella Flowing Form for heat protection, Wella Natural Volume Mousse for volume and curl retention and Wella Stay Essential Hairspray or Sebastian Re-Shaper for light hold. For a different look with the same haircut, swap out the curling iron for a flat iron and twist the flat iron around for a striking, tousled look. Because of the length in the front, this short style can be worn volumized or smooth. It’s the perfect combination of classic and contemporary hairstyling, using a disconnection to keep things from getting too bulky. Add a pump of heat protector to damp hair and blow dry with your hands or a flat brush. Use a smoothing product to give definition to the hair. Try Wella Flowing Form for heat protection. Wella Smooth Brilliance is my favorite smoothing product to give definition and rid your tresses of flyways. With this particular style, blow dry your hair using the contours of your head, do not blow dry up or out. When using product, less is best! This style will keep you looking effortlessly and naturally beautiful all season long. Add your favorite light hold mousse to damp hair and dry smooth. Wrap the outer layer of your hair around a 1-inch curling iron in vertical sections and tug on the ends of the hair to lengthen the curl pattern after curling. Run fingers through hair to soften it even more. As a finishing touch, spray some hairspray on your fingertips and twist selected pieces around the face and fringe for a more mature look. This classic bob and style will always be a timeless shape that is perfect for any occasion. Add your favorite heat protector to damp hair and blow dry with a flat brush. Gently pass your flat iron through the lengths of the hair to smooth the ends, but take care to leave a little volume at the roots. Add a lightweight smoothing product to tame flyaways and add shine. Try Wella Flowing Form or Wella Enrich Straight Leave-In Crème for heat protection and Wella Smooth Brilliance to tame flyaways and give a soft shine. Don’t flat iron at the root and make sure your products are only used from mid-lengths to ends if your hair is fine. We just can’t get enough beach wave in our lives! Keep a summer feel to your style all fall long. Add your favorite leave-in heat protector and shine serum to damp hair. Blow completely dry with a round brush or your hands until smooth. Wrap sections of your hair around a 1-inch curling iron and tug the section to lengthen the curl after curling. Mist with a medium hold hairspray to hold the style. I recommend Wella Flowing Form for heat protection and shine, Wella Oil Reflections for shine and Sebastian Shaper for hairspray to hold the style. Groomed eyebrows are must as this look accentuates the forehead and eyebrows. This hairstyle is perfect for anyone with fine hair that wants to have a great style and also keep the hair less oily for longer. Add a heat protector to the hair before drying the hair smooth with a paddle brush or round brush. Spray your favorite dry shampoo throughout hair from root to ends. Wrap sections of hair around a 1-inch curling iron and let hang to cool. Run your fingers through the hair to give an even more “worn in” look. Try Wella Flowing Form for heat protection and Sebastian Dry Clean Only for a dry shampoo. For the complete red carpet look, add red lips, winged eye liner and chandelier earrings! Here is another fall-inspired style that embraces the natural curl of the hair with an added side ponytail. Add your favorite leave-in curly balm and shine serum to damp hair. Rake your fingers through the hair to encourage the curls to become more curly. Allow hair to air dry or diffuse with high heat and low air pressure until completely dry. I recommend Sebastian Potion No. 9 for a leave-in curly balm and Sebastian Liquid Gloss for a shine serum. The finer your hair, the lower your side pony needs to be. This elegant updo is perfect for any night out. Its pompadour-esque front gives it a contemporary touch that keeps it modern for this fall season. Prepare the hair with a heat protector and a volumizing product before round brushing. Round brush as you dry the hair to add volume and bend to your strands. Separate a triangle section of hair on the top of the head (from the top center of the head to each eye). Backcomb the roots of this section and allow it to hang out of the way while you gently backcomb the rest of the hair. Gather all of the hair underneath the top triangle section and roll it. You can either roll it under or to the side (whatever your preference) before securing the hair to the head with bobby pins. Gently comb the top section back with your fingertips until it lays over or next to the section underneath and pin. Use a tail comb to add volume to the top by sticking the tail of the comb into the back combing and making small circular movements. Set the hair with a firm hold hairspray. Try Wella Flowing Form for heat protection, Wella Extra Volume Mousse for volume and texture and Wella Stay Firm Hairspray or Sebastian Shaper Plus for hold and style retention. Hot rollers would give this style the ultimate polish and volume needed to last for days. This volumized look has curls that move in different directions, giving the style volume and a wildly elegant finish. Add your favorite heat protector to the hair and then layer a volumizing product over the top of it before blow drying. Take 1-inch sections of the hair and curl them with a flat iron. Swap the direction you curl from section to section. Brush the curls out with your hands and then add a hairspray for hold. I recommend Wella Flowing Form for heat protection, Wella Extra Volume Mousse for style retention and volume, and Wella Stay Firm Hairspray for hold. If your hair is blonde, don’t be afraid to use hair chalks to switch up your color! Sharon Osbourne’s signature style is a staple in the salon world and it’s here to stay! Mix a heat protector and volumizer together before blow drying with a medium-sized round brush. Once hair is completely dry and has volume and some curl to it, add a texture product to the hair to give definition. Set the style with hairspray. Try Wella Flowing Form for heat protection, Wella Extra Volume Mousse for volume and style retention, Wella Rugged Fix for definition and Wella Stay Firm Hairspray for hold. As a finishing touch and for a more youthful look, you can spray a little hairspray on your finger tips to pull the wispy hair from around the ears forward. Blow dry with a medium to large round brush until completely dry. Wrap your hair around 1½-inch curling iron (curling away from your face) and let the curls hang to cool. I recommend Wella Flowing Form for gloss and heat protection and Wella Luxe Oil for a gloss that won’t weigh your hair down. Oval, round and diamond will look best, but a heart shaped face can pull this look off if as well as long as there is a fringe that could be swept slightly to the side. Add a broach between the back of your ear to the center back of your head for a more polished and elegant look that will help keep your hair pulled to the side. This is a great style for someone that has naturally wavy hair that wants something that will work with their natural texture this fall season. Add a leave-in product to damp hair before adding a sea salt spray, then allow to dry naturally or diffuse dry. Take the top section of the hair and backcomb only the roots to give a little cushion of volume to the entire top section. Finger comb the top section back and choose to either braid the ends of it together or leave with a simple elastic band resting over the top of the underneath section. Use a firm hairspray to set the style in place. Try Wella Flowing Form for a leave-in moisturizer, Wella Ocean Spritz Beach Texture Hairspray for texture and Wella Stay Firm Hairspray or Sebastian Shaper Plus for hold. Any face shape that does not have a prominent forehead will look amazing in this effortless hairstyle. Don’t be afraid to add glossing serum to the ends of the hair to give extra shine and definition! This style was probably done using her natural waves, but you can also easily recreate Vanessa’s look using a 3-barrel waver. Add your heat protector to the hair before drying with a paddle or round brush. Spray thin sections with a gentle hairspray. Allow it to dry a few seconds before using a 3-barrel waver on each section. Use a smoothing product to rid yourself of flyaways and add definition to the style. Try Wella Straight Leave-In Balm for heat protection, Wella Stay Essential Hairspray or Sebastian Re-Shaper for style retention, and Wella Smooth Brilliance to add definition and shine. This style will look great on anyone, but will work extra magic on those with high cheekbones or a sharp jawline. This color is still within the summer spectrum, but if you have this hair color and want to be fall-ready, cool the tone off a bit with a slightly darker beige that will give you an icy look in a warm turtleneck. With whichever of these celebrity-inspired fall hairstyles you choose, always remember to have fun, think outside of the box, then wear it with confidence and a nice pair of boots!